black ribbon flowers for sale item no. we have a lot of laborious manufacturing workers with rich experience to produce the above items every day! Holiday and Premium use black rose ribbon flower Our company specialize in ribbon various such as satin ribbon ,grosgrain ribbon, printed ribbon, gift ribbon, ribbon bows,award ribbon, ribbon rosette, Satin ribbon flower rose and so on . 1.Material : satin ribbon, grosgrain ribbon 2.Color: green, blue, yellow, pink, red, orange, purple, white, etc 3.Size: 5.5*6.5cm 4.Logo: custom Printed or solid color 5.MOQ: 500pcs 6.Samples Time: (1)3-5days-If you want to customize your logo. 7. lead time 7-20days 8.OEM Accepted Yes 9.Packing Details: 200-500pcs per pp bag,30-60bags per ctn,41*41*41cm 10.Production Capacity: 200,000pcs Per week 11.Payment Term: L/C,T/T,D/P,D/A,PAYPAL,WESTERN UNION,MONEY GRAM production show More products for you Packaging & Shipping Q1: what is your product Range9 1.ribbon,satin ribbon, polyester satin ribbon, grosgrain ribbon, organza ribbon and plaid ribbon, ect 2. printed ribbon,printed grosgrain ribbon,printed organza ribbon 3.ribbon bows, grosgrain ribbon bows, hair bows, satin ribbon bows,printed ribbon bows ect 4. award ribbon, printed award ribbon, award ribbon rosette. Item name: 100% polyester satin label tape GSM: 120g + - 5g Stock color: white and black (other color customize as color sample) Certificate: OEKO-TEX CLASS 1 passed Printing: suitable for Thermal Transfer printing, Silk screen printing,Flexo printing , Letter press etc. We focus on manufacturing and selling Label Materials, such as dipped coated nylon taffeta, slit polyester satin, Woven Edge Satin, Polyester Taffeta, Poly-Cotton Tape, Acetate Taffeta/Satin, Self-Adhesive Polyester/Nylon Tape, Iron-On Taffeta/Satin Tape, Non-Woven Fabric Tape, and Tyvek etc. which are able to satisfy the customers&rsquo; various needs and demands regarding the different printing mode and also the different industries. white,ivory,black, beige,aqua, as see in photo. Stock size are for 0-36month. Original design by QueenBaby. best-selling polyester decorative metallic edge grid ribbon mixed color ribbon,medal ribbon,grosgrain ribbon,stripe ribbon,secondary ribbon. with high quality, good shape, fine texture, high fastness, completive price and prompt delivery, har-shine ribbon is well recognized in ribbon industry. This kind of deco mesh is great for decorating weddings, Christmas parties, birthday parties or any special event you may have. Other products: Braided sleeve hair curler is made by braided sleeve, making perfect and charming curls, and don't hurt hair. Deco mesh flex tubing is used for decoration of string lights, Christmas and other festivals, floral design and gift wrapping. Alibaba.com offers 3,528 black ribbon flower products. About 5% of these are ribbons, 4% are gift ribbon, and 2% are decorative flowers & wreaths. A wide variety of black ribbon flower options are available to you, such as christmas, valentine's day, and halloween. You can also choose from 100% polyester, polyester / nylon, and cotton. As well as from printed, jacquard, and embroidered. And whether black ribbon flower is organza, taffeta, or grosgrain. There are 3,528 black ribbon flower suppliers, mainly located in Asia. The top supplying country is China (Mainland), which supply 100% of black ribbon flower respectively. 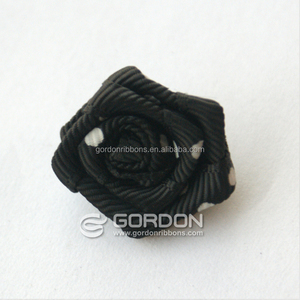 Black ribbon flower products are most popular in North America, Western Europe, and Domestic Market. You can ensure product safety by selecting from certified suppliers, including 917 with ISO9001, 425 with Other, and 92 with BSCI certification.